Somewhere around May 2012, a friend of mine drove across Havana to drop off a sack of books. “They’re good, not great. I don’t have room for them.” Who has room in their life for good, not great, books? Not my friend, nor me. But as I looked at that yellow bag of books month after month, an idea began to brew: what if Havana had an English-language bookstore and coffeehouse where Cubans and visitors of all types could sit in a hammock with a current magazine or classic book, sip a delicious cappuccino and make new friends? And so Cuba Libro was born. Over four years on, we’re very proud of the community we’ve built around great coffee and literature, ethical and social responsible business practices, a varied cultural events schedule, an organic farm share, donation projects and more. Please feel free to get in touch to learn more or check out our 2-year evaluation and roundup. 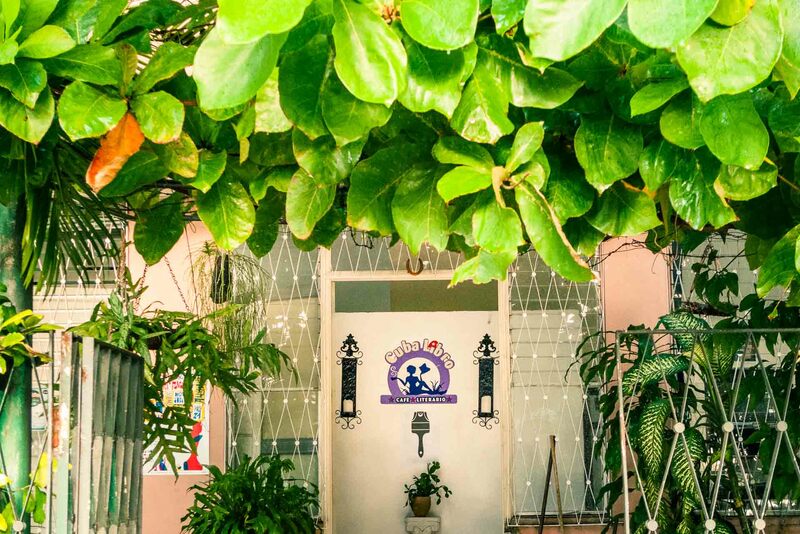 Cuba Libro, a coffeehouse and English-language bookstore, is an ethically- and socially-responsible cultural center dedicated to building, strengthening, and supporting the Havana community in which it operates. Through a variety of services, cultural activities, and literary- and educational-related initiatives that are accessible to Cubans and visitors regardless of age, gender, race, religion, sexual orientation or financial resources, Cuba Libro serves as an example of socially-responsible business in Cuba’s emerging private economy. Sharing our experience and know-how, we help other businesses and entities flourish while fulfilling social missions and commitments to the surrounding community – a critical component in Cuba’s evolving economy if the country’s social justice achievements are to be retained and fortified moving forward. Cuba Libro is a coffeehouse and English-language bookstore providing a prototype of socially- and ethically-responsible business in Cuba’s emerging economy. Through free cultural programming, high-quality literature, outreach and a variety of services designed to improve the health and well-being of our community, we are helping strengthen the social safety net. Cuba Libro serves as a beacon of social entrepreneurship by supporting and building on Cuba’s social justice and humanistic achievements realized over the past 50+ years. With policies and practices based on a philosophy of accessibility, equity, equality, and good cheer, Cuba Libro aims to provide a model for socially-responsible business in Cuba, with a specific goal of helping others replicate this model. By pooling resources, energy, and ideas, Cuba Libro sets the course forward to a better, brighter, and healthier future for the country and its people. Through teamwork exemplified and motivated by all sectors – individuals, public, private, local and international – we are confident we can help build a stronger, more resilient society. In 2015, a small, but dedicated group of supporters founded Friends of Cuba Libro, a 501(c)3 organization incorporated in New York, to support our cultural and educational outreach. In our first year, we started supporting two projects: home support for Cuban families with members suffering degenerative neurological diseases and independent media production; we're proud of the results of our first 100% Cuban-conceived, written, directed and produced short, The ISA Sessions I. More recently, we provided financial support for the production of the first long-form documentary dedicated to the life and work of Cuban artist Servando Cabrera Moreno entitled "Los cercanos dias del amor" and material donations to a variety of individuals and entities including the Dora Alonso School for Autistic Children; Therapeutic Clowns of Cuba and the William Soler Pediatric Cancer Ward; and inmates at the Combinado del Este prison.